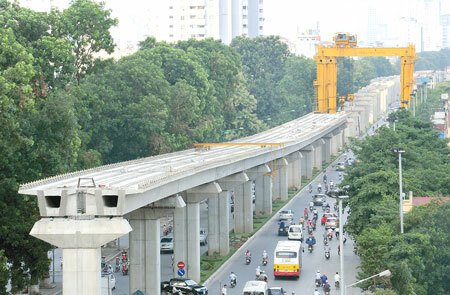 HA NOI (VNS) — Progress on the Cat Linh-Ha Dong Urban Railway Project was falling behind schedule and may result in the project being delayed beyond the deadline in March next year. This information was revealed at a meeting to review progress on the construction of the project's 12 stations yesterday. Director-General of the Railway Project Management Unit, Le Kim Thanh, said little had been done a month after the last meeting earlier this month. Contracts between the project's main contractor, the China Railway Sixth Group, and sub-contractors had already expired and were yet to be re-signed. China Railway Sixth Group said that except for La Khe Station, the costs for the remaining 11 stations were still being negotiated. The group promised to finish re-signing sub-contractors by the end of April as well as make overdue payments to sub-contractors. It also said engineers and machinery were on the way to Viet Nam and the project would be back on schedule as soon as possible. Deputy Minister of Transport Nguyen Hong Truong told the project management unit to quickly resolve issues, pointing out that many construction sites did not even have enough workers to function. "The way things are being handled right now. We won't see its completion even in 2017," said the deputy minister. Truong also ordered weekly meetings to be held after the upcoming holidays, to promptly address problems and improve co-operation between the parties. The deputy minister asked the Director General of the China Railway Sixth Group to come for a meeting with the ministry's leaders for a discussion before May 15. He also asked the main contractor to finish signing sub-contractors before May 1 and disburse at least two-thirds of overdue payments to sub-contractors before April 30.